The fifth film in the ‘Mission: Impossible’ series is a good old fashioned thriller that knows how to entertain, and it’s a film that shows a franchise at the peak of its power in terms of knowing its strengths and weaknesses. The ‘Mission: Impossible’ films are at their most enjoyable when the team are trying to solve seemingly unsolvable problems, largely by hatching intricate and death defying plans to achieve their goals, and it would be fair to say there’s no shortage of this in ‘Rogue Nation’. The film feels like a collection of stunning set pieces which the plot hangs on to, and all are magnificently put together, tense and exciting. The plot on this occasion revolves around the attempts of IMF to prove the existence of a shady criminal organisation known as ‘The Syndicate’. Meanwhile, a CIA agent (played by Alec Baldwin) is presenting a case to congress to shut the IMF down and bring their agents into the CIA fold. Neither of these stories are overly compelling on their own, but ‘Rogue Nation’ uses them as fuel for some great character moments and to create outstanding action cinema. Whatever anyone thinks of Tom Cruise in his personal life doesn’t compromise just how good he is as a movie star, and he shows once again how game he is for anything with the incredible pre-credits stunt clinging on to the edge of a plane. In most other films, this would be the big moment the script builds to, but in the world of ‘Mission: Impossible’ and Tom Cruise, this is merely a taster. The key addition to the cast this time is Rebecca Ferguson, who plays the duplicitous Ilsa Faust, a British agent deep undercover with ‘The Syndicate’ and their head Soloman Lane (Sean Harris) and the film plays its cards close to its chest around whether she’s a double agent or a triple agent. Ferguson is outstanding, portraying Faust much like a femme fatale from a good noir film, and she goes toe to toe with Cruise and excels. She’s equally comfortable playing the badass as she is showing a level of vulnerability, and she’s one of the main reasons ‘Rogue Nation’ works so well. As mentioned, the primary villain is played by Sean Harris, and he isn’t a particularly strong adversary, with his power coming more from what others say he is capable of than what he actually does, but when Rebecca Ferguson is doing such great work, we can forgive not spending more time with him. The film features countless brilliant moments, but perhaps the finest comes in a superbly tense early sequence at a Vienna opera house, where the scene is crafted so perfectly and so full of suspense it would have Hitchcock on the edge of his seat. McQuarrie’s direction skilfully shows us where each character is at any given time and compliments the tense action with the opera music (Nessun Dorma, always welcome). McQuarrie wrote the fourth film in the series, ‘Mission: Impossible – Ghost Protocol’ and he wrote and directed this one, showing that perhaps he is the best man to be involved in the franchise at this time. He absolutely gets what makes these films tick, and ‘Rogue Nation’ is a showcase of the series at its best. As the rest of Ethan Hunt’s team, Jeremy Renner, Simon Pegg and Ving Rhames do good work (even if Pegg and Rhames are largely playing the comic relief), and Lane’s main henchman, known as ‘The Bone Doctor’ (a great name for a villain! ), provides a solid adversary for the team to face off with before Lane comes to the fore. 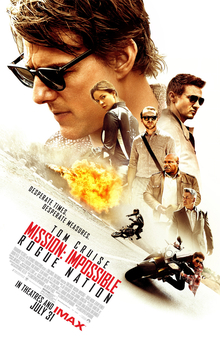 ‘Rogue Nation’ is a fine entry into the ‘Mission: Impossible’ series, combining a fast paced script with outrageous stunts and some great, charismatic leading performances, but more than anything this is just an absolute blast and it’s well worth your time.